I came up with the idea because my counters were always cluttered. I simply used pre-quilted cotton fabric measured to fit my refrigerator and added the pockets much like you would make a shoe bag, but of course, the pockets are smaller. I sewed double fold binding all the way around. The base fabric hangs evenly on both sides of the fridge and the other side can hold anything you want, medicine bottles (if you don't have children in the house), often used recipes, more utensils, etc. I'm putting this under decorating because it sure did make my kitchen look better. I think this is a brilliant idea! My husband always puts these items in jugs and jars on the (limited) counter in our kitchen. His excuse is that he cannot remember which drawer/cabinet they go in and therefore cannot find them when he needs them. Well, guess what? He knows where the fridge is! It hangs equally long on both sides and my kitchen rooster collection sits on top and holds it in place. I have also used magnetic clips on the bottom of each side to hold it securely. A cute variation on a shoe bag! My hat is off, my shoes are off. This is too cool! Do the same for office and art supplies, and we all will have super organized stuff! This is ingenious! There are so many other possibilities that come to mind, too. Besides hanging them across cabinets in craftrooms, offices or garages, you could also make smaller versions that could be attached to the backs of cabinet doors, trunk lids, etc. I'm intrigued and am itching to make a couple! Thanks for the inspiration! This is a great idea. How did you stick it on to your 'fridge? This is so practical and extremely attractive. Hat off to you on this idea. What a terrific idea! I have things on magnet hooks on the side of my fridge which fall off sometimes. This is just what I need. I wonder if you could make it out of clear vinyl to blend into the fridge color, but yours is so attractive. Great job! I love your idea but my kitchen is too tight for that. So it sparked the idea of a door caddy in my craft and laundry areas! Thanks! I love your idea but we have a tight kitchen. 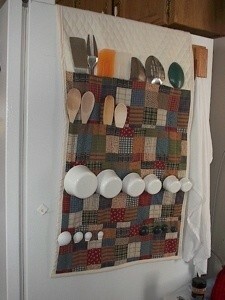 I thought that it would be great to use over a door in my laundry and craft rooms! Thanks! Also want to know how this is attached and held in place, please? It looks like it goes over the top of the fridge and hangs down on both sides, not on the door of the fridge. You probably would have to hang sort of equal weight items on both sides so it wouldn't slide down one side or the other. Maybe some type of strong magnets would work to attach it if you only have access to the door, as some fridges are enclosed on the sides. This is brilliant. I hang my pots on the side of the fridge with magnetic hooks like someone else said, but this is prettier.